Vinyl is used in many different forms of customized signs. 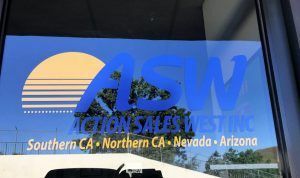 Action Sales West in Calabasas, California reached out to us for a custom door graphic of their logo. As you can see from the photo, their logo consists of two main colors so we used pre-colored opaque vinyl in two different colors to create this logo decal. To start on a window graphic, we need to know what is going on the window and the measurements of the window. With the measurements, we can determine how big we should make the graphic, and by looking at the artwork we can determine if and how we can recreate it for the sign. If we’re making a cut graphic like this, we like to use pre-colored opaque vinyl as opposed to digitally printing the color, especially if the sign is going to be installed outdoors. Not only does pre-colored vinyl look better, the color lasts longer. The only stipulation is that we may not be able to match your logo colors exactly, but with the many vinyl brands we have to choose from, we can come very close. To start making the graphic, we need the vector file so we can plot out the different components of the logo onto different colors of vinyl. Once the lettering and logo are plotted, we attach it to application tape and make sure that everything is in the right place. This makes transportation and installation very easy because the graphic will not move because it is secured by the application tape, and once we get to the location we just need to make sure the graphic is straight and in the correct location, and we can apply it directly to the glass. With the use of our plotter, we can make you graphics that are completely customized for your business.